Equipment: satellite TV; internet access Wi-Fi (payment, on order); washing machine; electric heating; underfloor heating (only in the bathroom/s). detached house, 4 - 5 people, 3 room/s, 2 bedroom/s, 1 bathroom/s, approx. 73 m², 2 floor/s. Kitchen: Kitchen/ cooking equipment: 4 electric plates, oven, dish-washer, refrigerator, coffee machine, freezer box approx. 300 litre. in the living room (ground floor). Access/parking: Access to the house via footpath approx. 50 m. parking near the house approx. 50 m.
Bathing jetty/bathing: landing jetty (shared use) in approx. 30 m, bathing jetty (shared use) in approx. 30 m.
Information on the boat(s): Motor boat (15.0 hp; 17.0 foot; payment, on order). Motor boat (payment, request on-site). Beach/waters: Fjord (without crossing the street) in approx. 1 m (Arnafjord). Bus stop: Bus stop in approx. 125 m (Nese Snuplass). Most stunning view we've ever had! We have traveled all over the world, and seen many beautiful places, but this view cannot be beat! The cabin is simple, clean and cozy. The owner is very nice and accommodating. There is also a very friendly dog that likes to visit and get some attention (belly rub) daily! It's location might be difficult for someone with physical limitations, as there is a hike down the hill from parking (and back up) and the stairs to the bedrooms are quite steep. This was not a problem for us, but might be helpful to know for others considering the property. We were able to use this as our home base and explore some other fjords. 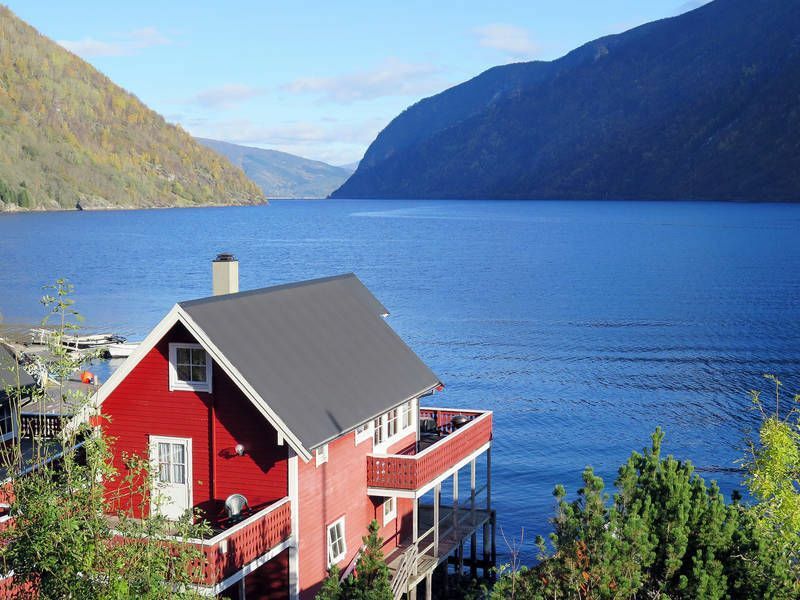 Norway is a stunningly beautiful country, and its inhabitants are very friendly. Das Haus liegt in einer sehr schönen Gegend mit einer sehr schönen Aussicht. Die Ausstattung vom Haus hat nicht zuviel versprochen es war alles vorhanden , es war sauber und sehr gepflegt. Wenn man fragen hatte konnte man sich jederzeit an die Vermieter wenden , sie waren sehr nett und freundlich. Es hat dort alles gepasst und man kann es nur weiter empfehlen. Conforme à l'annonce, cette propriété se trouve dans un cadre magnifique, très calme.